Another animated Scooby snack is in the works for home video this March. In an early announcement to retailers, Warner Brothers has revealed 'Scooby-Doo! Music of the Vampire' featuring the voices of Frank Welker, Mindy Cohn, Grey Delisle, and Matthew Lillard will hit Blu-ray on March 13. 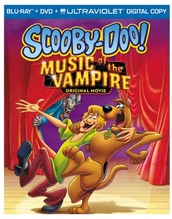 When Daphne becomes the star of a vampire film, the production is thrown into chaos by a real vampire, forcing the Scooby-Doo gang to investigate who's behind this monstrous mayhem. Specs and supplements have yet to be determined, but suggested list price for the Blu-ray/DVD/Ultraviolet Digital Copy combo pack will be is $24.98. You can find the latest specs for 'Scooby-Doo! Music of the Vampire' linked from our Blu-ray Release Schedule, where it's indexed under March 13.